Country legend Merle Haggard is known for his 1969 hit "Okie From Muskogee," reportedly a tongue-in-cheek lampoon of his father's attitudes that became an accidental anthem for nonsmokers with its line "We don't smoke marijuana in Muskogee/We don't take our trips on LSD." HVYMETL commented on YouTube: "My cousin's band opened for Merle long ago in the 70s. He said they partied in Merle's hotel room after the show and Merle told him how Okie' was written. They were in the tour bus, totally stoned and as they saw the Muskogee sign one the highway the bass player said, 'I bet they don't smoke marijuana in Muskogee,' and that led to the first line of this great song." Haggard was a longtime admitted recreational user of marijuana and an advocate for legalization. He told Reuters in 2009 he used marijuana medicinally after a doctor said it was a good substitute for his Valium habit. He gave it up a few times over the years, but "nothing was funny," he said. Haggard, who served time in prison for petty crimes as a young man (and was pardoned by then-Governor Ronald Reagan), saw Johnny Cash play at San Quentin. Today he tours prisons, "especially women's prisons, they get overlooked," he told Reuters. "There are some people in this world that have no idea what the real deal is," he told the Bakersfield Californian newspaper, when asked about Willie Nelson's 2010 arrest for pot on his tour bus. "I think it's silly to put someone in jail for [marijuana possession]. I think it's a threat to the pharmaceutical industry that you can go to the garden to grow something that might keep you from having to use Lipitor." 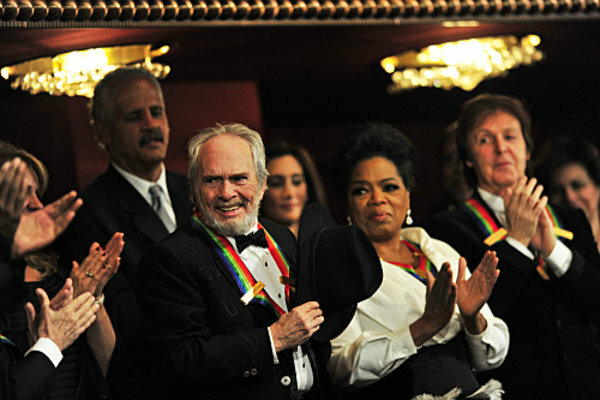 In December 2010, Merle Haggard was honored with a Kennedy Center Award (pictured) by VIP Barack Obama alongside VIPs Oprah Winfrey and Paul McCartney. Haggard spoke about "Oakie from Muskogee" on a 2011 Real Time with Bill Maher episode saying simply, "I am seldom in Muskogee." Maher quipped, "And I bet Willie Nelson is never there." Haggard then said Hillary Clinton came onto Willie's bus, "And I think she inhaled." VIP John Denver sang a verse to "Muskogee" that hammers home the point that it's a parody song, and Kris Kristofferson's lyrics say, "We don't shoot that deadly marijuana /We get drunk like God wants us to do." When Haggard appeared at the Mateel Community Center in Redway California on September 14, 2012, he stopped "Oakie From Muskogee" after the first line, and enjoined the crowd, "Everybody that's for marijuana, say 'Aye!'" (shouts of "Aye!" from all). He continued, "and the ones that don't like marijuana can go to hell.". The beloved singer released an album with VIP Willie Nelson featuring the song "It's All Going to Pot" in 2015; he died on his 79th birthday in 2016.